“The school supports about 250 deaf children and young people aged from about 4 to 25 years. Around 100 of the students are boarders and come from all over Sierra Leone. There are 30 classes most of which have 6 to 8 students. The first and middle school classes of the school follow a primary type of curriculum though the older children in the middle school (aged approximately 9 to 14 years) do have some classes in sewing, carpentry, IT and agriculture. The upper school pupils are split into two groups. One group follow a mainly vocational curriculum with, of course, basic literacy and life skills. Instruction in agriculture, carpentry, tailoring, catering and arts and crafts is normally available and most will study at least two of these. The second group are given a secondary more academic curriculum and prepared for external examinations where possible. They will normally continue to receive some vocational classes on their chosen subject. The academic stream, after their first year, normally attends some lessons in the Junior or Senior Secondary schools which are adjacent to the school for the deaf. In addition to those students attending regular classes at St Joseph’s School for the Deaf, there are quite a number of older students who have completed the school courses and are preparing for employment. They may be working in the school farm or helping in the carpentry department or be in a temporary work experience placement in the area. About half a dozen boys live in supported lodging in Lunsar which is about 15 miles away and attend a technical school where they learn carpentry or other building trades. The school embraces a number of teaching methods. There are a large variety of pupils. They all have a hearing impairment but whilst some were born deaf and were admitted to the school with little or no speech or language, others lost their hearing at a later stage in life. The children are grouped in classes according to their age and ability and may require different teaching methods. The policy of the school is to fit the all children with hearing aids and make every effort to help them to speak intelligibly. However most of the born deaf children will also rely on lip-reading and sign language to some extent. 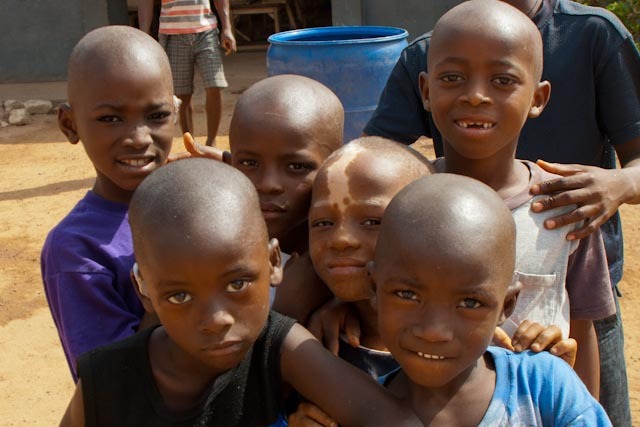 Sadly children in Sierra Leone who become severely deaf (often following malaria) are really not able to continue in normal primary or secondary schools. St Joseph’s school does therefore pick up a significant number of children in their teens who have had to drop out of their local school after becoming deaf. The secondary academic stream is largely made up of these students. Following the disastrous ebola outbreak, the school will re-open at the end of March. It will however take a long time before things are back to normal. The first priority is to help the older vocational students into work and assist the academic ones to get back to their studies in order to sit the exams they missed in the summer of 2014”.